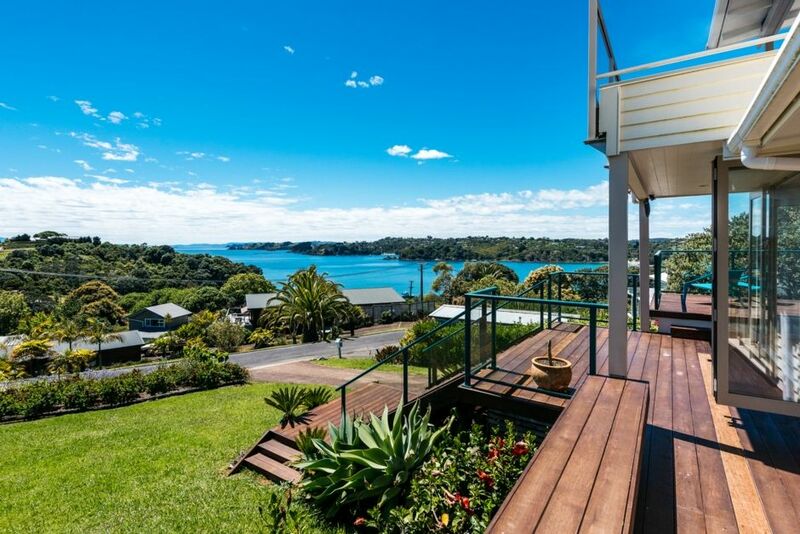 Double Bay Views has exactly what you are looking for in a holiday home - stunning views on all sides, stylishly furnished, a chefs kitchen, and walking distance to the beach and to the cafes in Oneroa! The property sits on a hill to the side of Oneroa, giving it elevated views out over Oneroa Bay, over the Gulf and even around to Blackpool at the back. Facing north, it gets great sun all day long. A large open plan living and dining room lead through into the huge kitchen, perfect for catering purposes. The kitchen has a separate storeroom, and opens on 2 sides to the back courtyard and BBQ area. Off the living room to each side are bedrooms, each with an ensuite, and each opening onto the deck at the front. Stairs lead up to the huge master bedroom, with a lovely ensuite, gabled ceiling and its own private deck, with the best views in the house (possibly the island!). This property is built to take advantage of the commanding views and the sun - there are bi-fold doors from each rooms, meaning a fabulous indoor/outdoor flow. All 3 bedrooms have fabulous views, you can wake to the sun streaming in and sit and enjoy your cuppa with a view! This outstanding location is only a minutes drive (or 10 mins walk) from Matiatia Ferry Terminal. Stroll down the hill to Oneroa for the morning coffee, and the beach is a few minutes walk away as well. With multiple wineries and restaurants within a few minutes drive, you will struggle to decide how to spend your days! All bookings incur a one time linen and exit cleaning cost of $200 so you have nothing to do but relax, refresh and enjoy. Double Bay Views is a beautifully presented holiday home with amazing 180 degree views over the Hauraki Gulf. It has exactly what you are looking for in a holiday home - stunning views on all sides, stylishly furnished, a chefs kitchen, and walking distance to the beach and to the cafes in Oneroa! Peaceful, beautifully furnished, perfect for a break from the city! Great views. Very comfortable place to stay with all of the essentials, we thoroughly enjoyed our visit and would highly recommend. Great and well priced property. We are so pleased you enjoyed your stay - please do come back again! The property is amazing, with lots of space and fantastic views, in a peaceful location just a short walk to Oneroa village. We highly recommend. The views are lovely aren't they? We are so pleased you enjoyed your stay - please do come back again!